Is there still a way to load the original fonts? Hi, I’m currently in the process of adapting EasyRPG to work with my older games. They pretty much work, but are littered with little custom hacks in the assembly, so I need to get my own hands dirty there, heh. No problems there so far, but the fonts are bothering me a little bit. The games have quite a bit of text burned into pictures and I also personally prefer what used to float around as RMG2000 font. I understand why you can’t include it and all that, so I just want it for my custom build. What I’m unsure about is if you can still load in these fonts or not. There are remnants of FreeType font classes in font.cpp, but my attempts in having them replace the default fonts just segfault without any meaningful error output before it (I expected some since it looks like there would be error handling). The second option would of course to adapt the bitmap font to look exactly like RMG2000. This isn’t hard, rather than just tedious. Either by hand or coding a tool that hopefully makes no mistakes in the process. Has this work been done before or is there a tool to aid me already (since your almost-BDF .bit font format seems custom)? EasyRPG Player supported .fon files via SDL_ttf (a FreeType frontend) and even with FreeType if I recall correctly, but this feature got dropped and abandoned years ago once embedded BDF fonts landed. There are plans, however, to bring back custom font support via FreeType+Harfbuzz for complex font support. Because this library supports TrueType, OpenType and, of course, fon/fnt and other bitmaps support, it would be feasible to recover this feature once it lands to Player. A development branch exists but still requires some improvements (and rebase the code). No idea what is broken about using freetype, this part is just untested, as we do use our own bitmap font. However, needs to be fixed of course. Looks like I started something there. Thanks for working on that stuff! I’d say it comes down to personal preference and me being exposed to this font for almost 15 years, I think. You can ignore the mix of lanugages which come from an in-progress translation there. The customized loading scene uses the hero hp for one number and just a face for the other. I think the font does a good job on paper, but pales a bit in direct comparison. Overall it’s a pixel or two too far up, which makes the text receive the brighter part of the gradient. It’s also occupying less space. It does look cleaner, though. The rendered number in the load scene looks like I messed up the y-coordinate, but it’s actually correct with the edited glyph. What I’m slightly confused at is that this is font called ttyp0 in the source code and not rmg2000, which is the other font. I’ve read in one issue that supposedly the font names were swapped in the Maker translations. However the font file used in RPG_RT is also called RMG2000 and matches what should be on the screen. Odd, but ultimately just me nitpicking. While it probably makes little to no difference, I don’t even mean exactly Don Miguel’s shipped RMG2000 font when talking about it, but rather the GSandSDS’ fixed version with european characters, if that matters. This one was commonly expected to be installed in German communities. The current one is still totally fine, but when I’m uploading a game running with EasyRPG myself, everything should match. Looking forward to the custom font support, but as said, I might also just bite the bullet and recreate the font in the bitmap font format EasyRPG is using right now. WenQuanYi — bitmap version of WenQuanYi, contains most Chinese characters and is used as fallback when all the other fonts fail. Maybe the naming of RMG2000 was not a very good idea (it was my idea, sorry), because it’s not Stifu’s RMG2000. My idea was ‘people used to have many versions of RMG2000, all named RMG2000’ (at least I remember downloading a Polish font pack with a lot of different fonts, all named RMG2000), so I’ve thought that RMG2000 refers to ‘any gothic font for RM2000’ and not the exact design by Stifu. 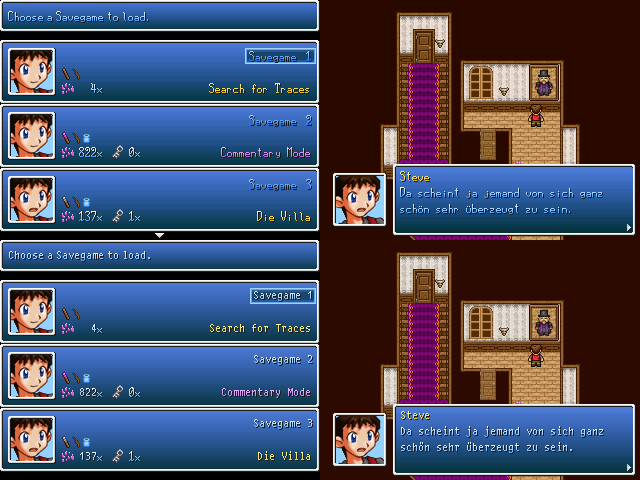 Also, note that different versions of RPG Maker differently decide which font is serif and which is sans-serif (I think Don Miguel does it one way and official Maker does is another way; IIRC we follow Don Miguel in this). I don’t think there is a simple way out for this. These fonts were the default Japanese system UI fonts since Windows 3.1, now known as MS Gothic and MS Mincho. Monospaced and with bitmaps at small sizes. Using half-width and full-width features, so for latin glyphs and other scripts used half-width. MS Gothic looked like a sans-serif font and MS Mincho like a serif font. Don Miguel’s translation with Stifu contributions contained the mentioned RMG2000 and RM2000 in .fon format, RPG_RT font loader was working nicely with them, as occidental Windows 9x was not providing Japanese fonts by default, so they provided them and patched RPG_RT to use them, provided by the custom RTP installer.